At this year’s Commencement, Wesleyan hosted a reception for a small contingent: students who are the first in their family to earn a college diploma. President Michael S. Roth ’78, along with Dean Marina Melendez ’83 MALS ’88, offered personal congratulations. 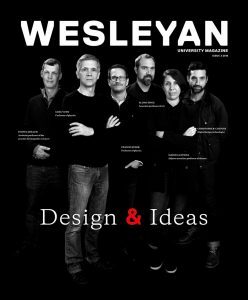 That the Wesleyan president and dean of their class were first–generation graduates themselves was not lost on Toni Zosherafatain ’10, a member of the WSA who first proposed this event last winter. While these students report financial responsibilities that affect their time management—the need to take on additional jobs while still pursuing studies, sports, and volunteer work—they are also apt to note the less tangible ways that set them apart. For some it’s an understanding that the diploma is beyond personal achievement; it validates the family’s sacrifice. Others speak of the guidance they wish an experienced family elder could have offered. English is not Zosherafatain’s first language; she is the child of Iranian and Greek immigrants and learned English in elementary school. At Wesleyan, she majored in government, earning a certificate in international relations. She was also elected to the Wesleyan Student Assembly, with a platform to represent students of color, LGBT, and diversity. “My passion is that someday I want to run for political office, motivating people and bringing people together around social justice issues,” she says. Quainoo, a sociology major who held as many as three jobs during some semesters, found informal mentors in other students. They introduced her to the Health Professions Partnership Initiatives program, coordinated by Professor of Biology James Donady, which helped shape her educational career. The result: “I learned to be more of a go–getter, ready to take on any challenges. My big goal is to be a pediatrician,” she says. With his increased confidence, Flores applied to the McNair Fellows Program, which funds student research with a stipend. “The program made me realize that a PhD was an appealing goal; as a child I’d never had a role model who encouraged me, through example, to consider anything beyond a master’s degree,” he says. Next fall he begins engineering courses at Columbia in its 4–2 program, after double–majoring in math and Italian studies, with a semester abroad. Miller’s parents neither attended college nor expected that their daughters would. She applied to Wesleyan, was accepted, and arrived in Middletown without ever having been on campus. “When I got here, I had no idea what a PhD was, and at first I was embarrassed to ask,” Miller recalls, but she dropped the fear in preference for information. She majored in neuroscience and calls the McNair Program one of her three “saving graces.” The other two: Dr. Philippa Coughlan, director of the university’s Behavioral Health services; and Miller’s work with Associate Professor [of Psychology] Matthew Kurtz at CVH in the schizophrenic ward.